Kale chips – Easy to make yourself or pick up in the grocery store, kale is fast moving from its supporting role as a buffet garnish to the star attraction. To make, simply rinse kale leaves, tear into large pieces, toss in olive oil and a dash of salt, and roast at 350°F until crisp. These melt-in-your-mouth leaves have a nutty flavour, but never mind that, kale is loaded with fibre, potassium, vitamin C and B6. A cup of kale contains seven times the recommended daily allowance of vitamin K. It has more iron than red meat and has zero fat, making it ideal for calorie-reduced diets. Because it’s a dark leafy green, it’s loaded with folate, an essential mineral for pregnant women. Popcorn – that’s right, popcorn, but air popped and without the butter or “buttery” topping. Even if popped in 2 tbsp of olive oil, it’s still pretty low in calories and a great source of fibre. One cup contains only 30 calories, and it’s full of antioxidants. 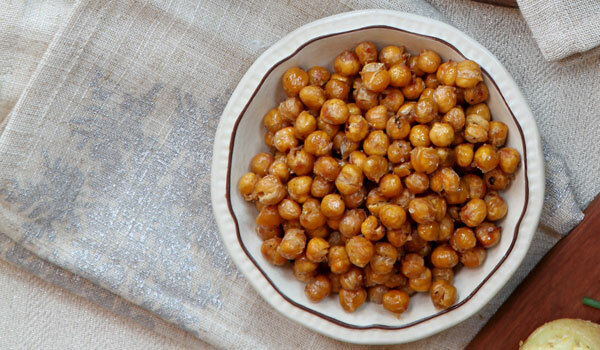 Roasted chickpeas – also known as garbanzo beans, these economical wonders can be added to salads and sauces, but they’re also delicious on their own when roasted, a low-cal substitute for nuts. Simply toss in olive oil and spread onto a cookie sheet, add your favourite seasoning and bake at 350°F until brown, gently tossing once or twice for even doneness. Chickpeas are legumes, so they’re a fibre superstar. And it’s mostly insoluble fibre, which means it doesn’t get digested until your large intestine. They also create probiotics in your gut, which promote production of healthy bacteria. Yogurt – Even regular fat yogurt is much lower in fat than ice cream, which typically clocks in at 10% milk fat (M.F.) If you’re looking for that creamy “mouth feel” of ice cream, then yogurt is a natural choice. Choose a yogurt with no sugar added to keep the calories down. Plain yogurt with your own drizzle of honey or jam is even healthier, and some would say tastier. Yogurt with live yogurt cultures (check the label) is a probiotic food, which helps keep your gut healthy and functioning. Greek yogurt is even higher in protein, so keeps you full longer and stabilizes your appetite. Freeze it for that ice cream experience. Did we mention that yogurt is a good source of calcium too? Cottage cheese – High in protein and low in fat make cottage cheese a dieter’s best friend. If you’re craving a few slabs of Brie, cottage cheese delivers that same savoury, creamy taste, without the M.F. and calories. Like most dairy products, cottage cheese is high in calcium and phosphorous which promote healthy bones. Go for low-sodium varieties as cottage cheese can be high in sodium. Smoothie – So much of snack cravings centre around texture, and a smoothie is just like the name sounds. This is where your blender becomes the best appliance in your kitchen. Blend frozen fruit (bananas work well) with juice, a bit of honey and a splash of orange juice and the natural pectin and ice content of the bananas will help form a thick consistency. If it’s too thick, loosen with a bit of water or more juice. Customize your smoothies with whatever fruit you have on hand. Whenever fruit is starting to near its expiry date, chop it up and toss in a resealable freezer bag for your next concoction. Cacao nibs - Chocolate is the number one craving on many snackers’ lists. Cacao nibs hit the sweet spot, without the high fat content of milk chocolate, or the added sugar of chocolate bars. These little chip-like snacks are actually cocoa beans that have been roasted and broken into smaller pieces. The health benefits are even greater than dark chocolate: they’re loaded with magnesium which helps muscle and nerve function; they’re high in fibre and iron and because they are less processed than dark chocolate, they’re higher in antioxidants. Cacao nibs do contain caffeine, but only about 5% the amount found in a cup of coffee. It does, however, contain theobromine, which can produce a stimulant effect. Fibre 1 Bars – These protein bars and brownies are low in calories and high in fibre, but still high in taste. Fibre 1 Brownies are only 90 calories each but include 25% of our recommended daily amount of fibre. Fibre 1 Chewy Light Bars are 100 calories for a 120 gram bar, and include oats. And Fibre 1 Protein Bars include 6 grams of protein and 140 calories. Plus, they pack easily so you can avoid having to make stops at fast food outlets when you’re on-the-go (and who isn’t?). Raisins – Long billed as nature’s candy, raisins are nutritional powerhouses, packing a lot of health benefits into those little tiny fruits: constipation, anaemia, eyes and bones can all say thank you to raisins. Edamame (soy beans) - Edamame and umami go together like peas in a pod. Umami, identified as the savoury flavour found in glutamate, is found in lots of foods, and most famously bacon. Of course, we crave bacon for comfort reasons too, but part of the mouth-watering allure is that umami flavour. Edamame and other soybean products are high in umami but also low in sodium and fat, which bacon can’t claim. Seaweed – Once relegated to the bottom of the ocean, seaweed in all its many varieties is surfacing onto salad plates (dulse) and snack bags (nori). Seaweed is high in calcium, anti-oxidants, vitamins A and C and B12.